Had an animated debate with PP and others on audifans many years ago on this very topic (torque of crank bolt). One of the rare occasions where the theoretical physicists were right (saying the length of the torque wrench had to be taken into account when using a torque multiplier), and the practical mechanics were wrong (saying length was immaterial). I think Phil was the one who found a note on some Audi document showing the two different torques depending on whether you used the 2079 extender or not. On my I5 10v engines (KK on my 80q, WC on my 83 100 and KU on my 89 100), they all used the same crank gear with the integrated key (035 105 263 C). In 1989, the part number changed to 034 105 263 A, and that number is still valid for the AAN engines up to 1997 or so. I have a vague recollection that the new gear matches the new timing belt (different number of teeth? ), and there might also be a different water pump required. Maybe the new gear requires the new locking tool? The old I5s use the 2084, whereas AANs use the 3256. On the other hand, you will find woodruff keys on some I4 engines. All too common this failure! The 2.5TDi's do it too if crank bolt not tight enough. 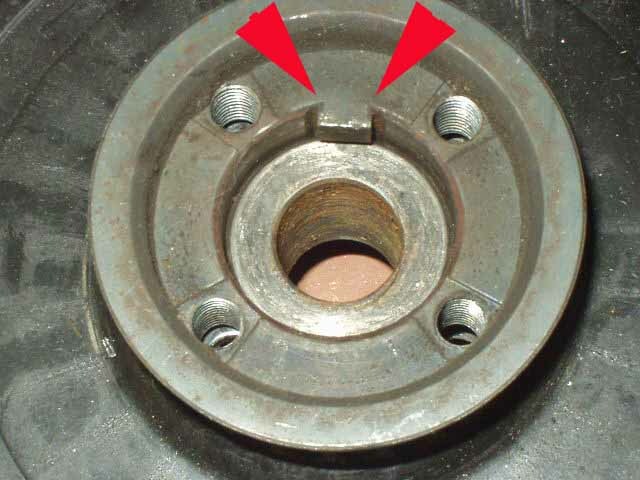 That belt pulley (being a sintered metal item) can crack through one of the 4 mounting bolt holes. If you then remove it from the vibration damper they can open up and weaken, causing failure even if the bolt's tight!! I keep a lower pulley in stock as they are that cheap! Also, if you do an I5 timing belt BUY THE CRANK LOCKIN TOOL!! It's not a cheap alternative to not buy it when ya engine falls to bits later on! Really sorry to hear about your particular failing mate. I bet ya gutted! Good luck with repair. Nice to see myself debated. Both are right about the crank pulley using and not using a Woodruff key. On some it is machined in the pulley and an integral part of it, on others it is pressed in and is therefore techically a Woodruff key - although you can't remove it. Don't forget the pulley is detachable from the harmonic damper and a lot cheaper. As far as I'm aware trhe nominal torque at the bolt for all I5s is 332 lb ft, 450 Nm. But the 10/93 Technical Service Bulletin for the ABY and AAN engines specifies 150Nm + 180°. DO NOT EVER LOKTITE THIS BOLT! It's hard enough to get off as it is - but the moron who put blue Loktite on an Audi 200 once caused half a dozen of us a day's work. It eventually came off at 820 Nm with three people standing on the engine and a serious ratchet cargo tie wrapped around the left engine mount to stop it shredding. Audi suggests a thin film of anti-corrosion compound on the mating faces. Yesterday I discovered the root cause was a sheared key on the lower crank timing pulley that mates with the crank pulley bolt. This has disintegrated causing the timing pulley to spin on the crankshaft. Ouch. During normal operations the key experiences zero shear force. It's there to roughly align the crank with the harmonic damper so that most cambelt/timing operations take place at or very near crank TDC. A savvy mechanic will have the head at TDC, so nothing can bend anything. a) Monkey lad doesn't tighten the bolt adequately. This is the idea of "let the air wrench rattle long enough and he bolt will be tight enough". It won't. b) Clever monkey lad concentrates on the bolt staying in - the Loktite philsophy. Even if you don't tighten it enough, loktite will stop it coming out. True - but it also results in the pulley being inadequately clamped to the crank. Once the key starts to perform any kind of function in a running engine, it's only a matter of time until it gives way. I use a Sykes Pikavant 1000Nm torque wrench that's nearly five feet long. I have on several occasions set up to remove a harmonic damper bolt and watched as the weight of the torque wrench has undone it for me. The event occured on quattrokid's drive, though it wasn't his car. I'm sure he'll remember it. This thread makes me think I should do the cambelt change on my 90 20v myself, rather than letting the local garage have a go at it... Torque wrenches of the required force seem rather expensive though. The last time I got a garage to do a cambelt was on one of my Honda's. Thought I was doing the right thing by taking it to the Honda supplying dealer, but sadly they mucked it up & best of all wouldn't accept that they could have made a mistake. A long time later I re-did the job myself & the car was a lot happier as a result.